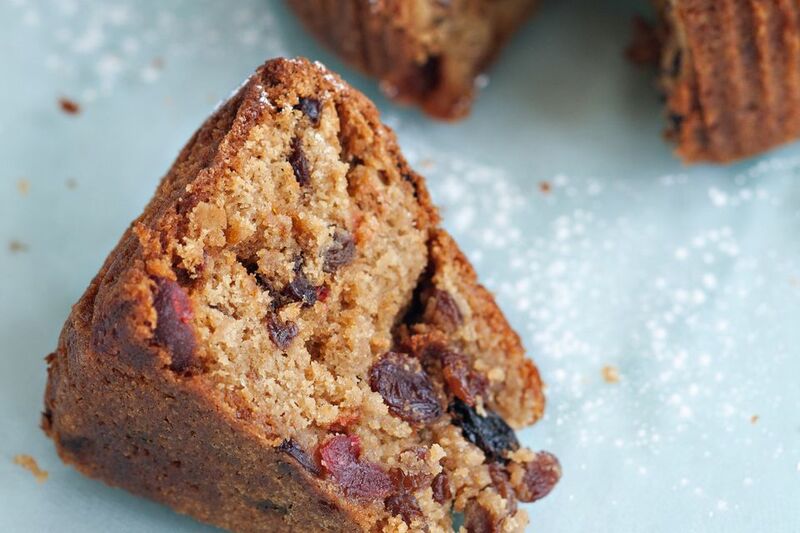 The dried fruit is soaked in bourbon overnight, so plan to begin this cake a day in advance. Use a good quality Kentucky bourbon in this recipe. You may add some candied peels or citron to the cake as well. Just decrease some of the other fruits. And feel free to use walnuts instead of pecans. The green and red candied cherries give the cake a beautiful color. In a medium bowl, combine the cherries, raisins, and bourbon; cover and let soak overnight. In a large bowl, cream the butter and sugars with an electric mixer until light and fluffy; add the egg yolks and beat well. Stir in the soaked fruit with bourbon. In a small bowl, combine 1/2 cup of the flour with the pecans; set aside. Add the remaining flour, nutmeg, and baking powder to the creamed mixture and blend well. In a bowl, beat the egg whites with an electric mixer until stiff peaks form; gently fold into the cake batter. Sprinkle the floured pecans over batter and fold in gently. Grease and flour a 10-inch tube pan and line the bottom with greased waxed paper. Pour the batter into the pan; bake at 275 F for about 3 to 3 1/2 hours, or until a wooden pick or cake tester inserted in center comes out clean. Set the cake on a rack to cool. Turn cake out of the pan, peel off the waxed paper and store in a tightly covered container for several days.